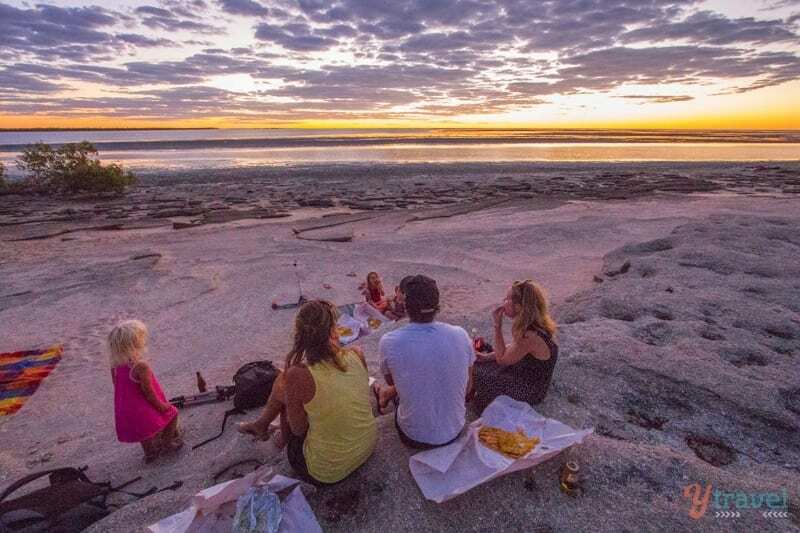 We originally thought we’d take a few days to drive The Savannah Way in North Queensland – and it would just be a few days of transit driving, stopping only for food and sleep. 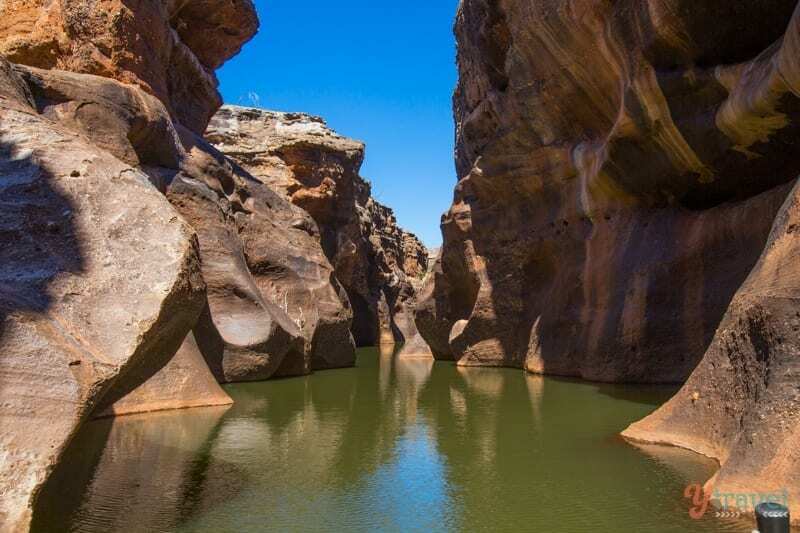 Outback Queensland continues to surprise us with so much more than just the Great Barrier Reef. The Savannah Gulf region is a dry and barren side, yet on closer look, a thriving one. 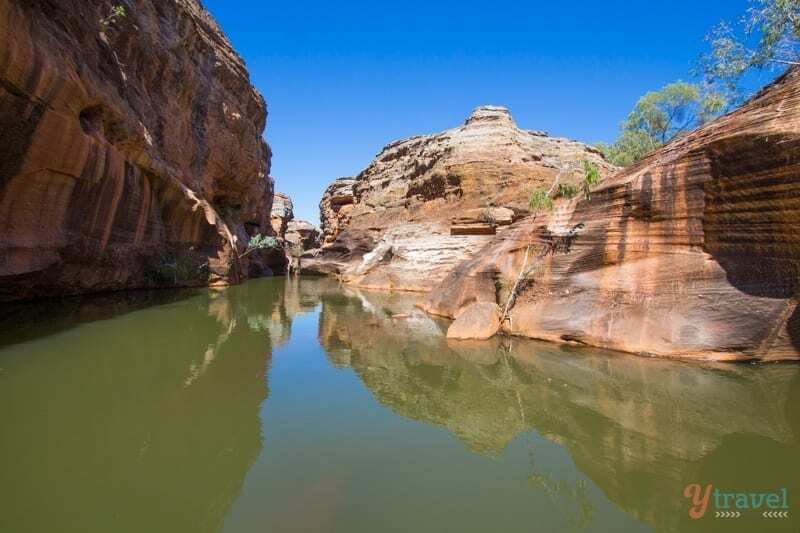 It’s worth spending a few minutes stopping at one of the many wide, dry river banks and contemplating what it must look like during the wet season when it’s completely full of water – and then some. Imagining that water breaking the banks and rising up like the 1974 floods. It will blow your mind. You just can’t imagine how it can go from bone dry to flooding with enough water to provide the needs of Australia and then some. But that is this amazing Gulf country in northern Australia. 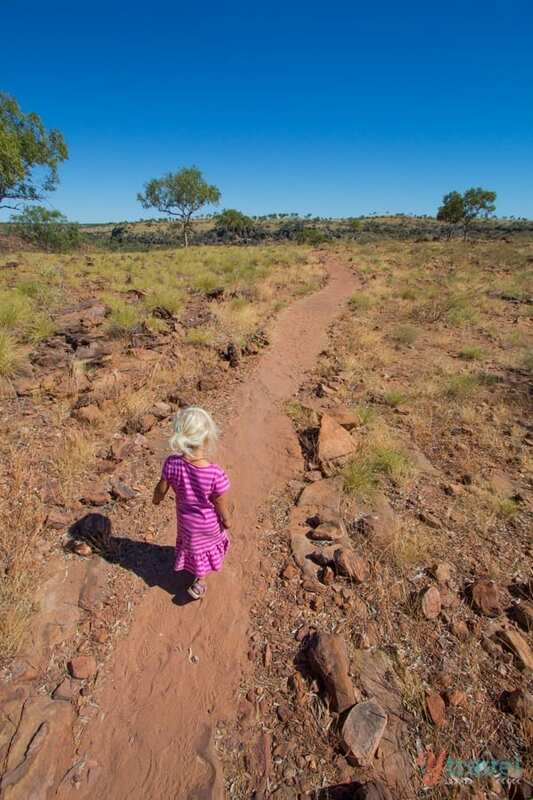 We were kind of chuffed to be travelling along The Savannah Way with our own little Savannah. We named her Savannah for two reasons: because we love the city in America, and because we love the African Savannah – a wild place. Now she gets to meet her namesake in Australia, except this Savannah is filled with kangaroos and emus instead of man-eating lions. There’s plenty of things here that will kill you though from snakes, to crocodiles, and poisonous plants, so keep your wits about yourself. 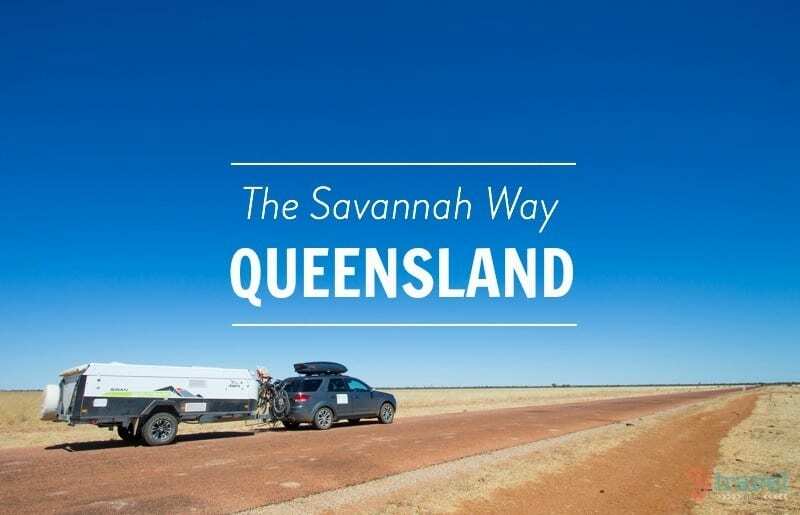 The Savannah Way is the ultimate road trip in Australia, stretching from Cairns in Queensland to Broome in Western Australia. That’s from East to West for those who don’t know, taking in a whopping 3,700 km. The majority of the svannah Way is sealed road, but there are sections that turn to gravel and plenty of tributaries offering that wild off-road driving experience. 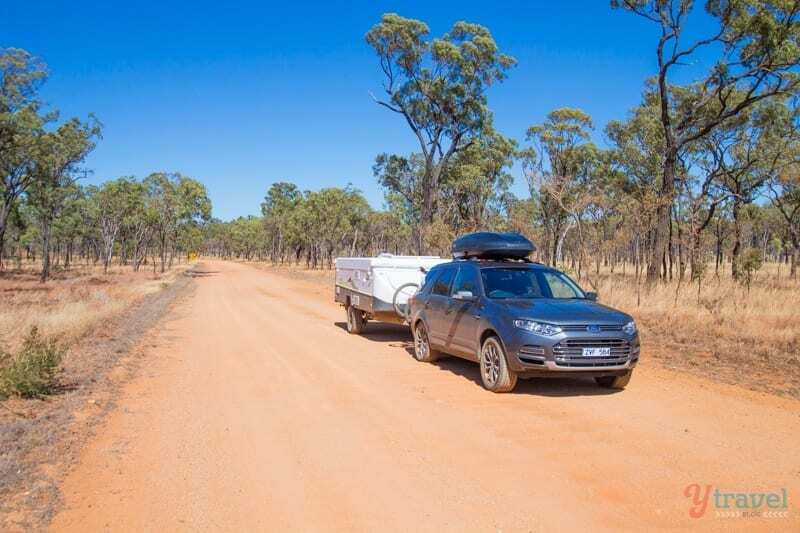 Our Ford Territory is an all-wheel-drive and not built for the hard-core 4wd section so we took the alternative routes. 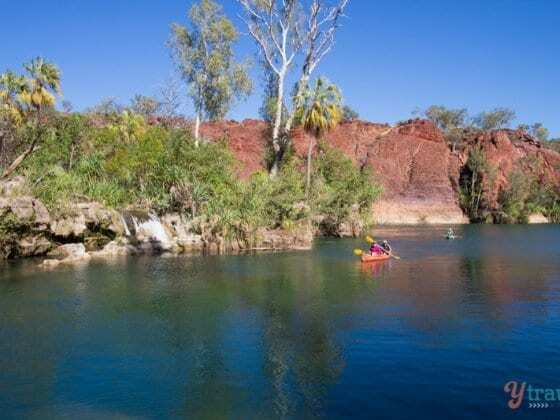 Below is our suggested guide and places to visit along the Queensland section of the drive from Cairns to the Northern Territory border. Just reverse it if you’re coming from the opposite direction. We stayed for two nights in Atherton, and depending on your interests this is enough time to see the highlights. It’s a beautiful region that varies from agricultural farmlands, to ancient rainforest with stunning waterfalls and scrub land. 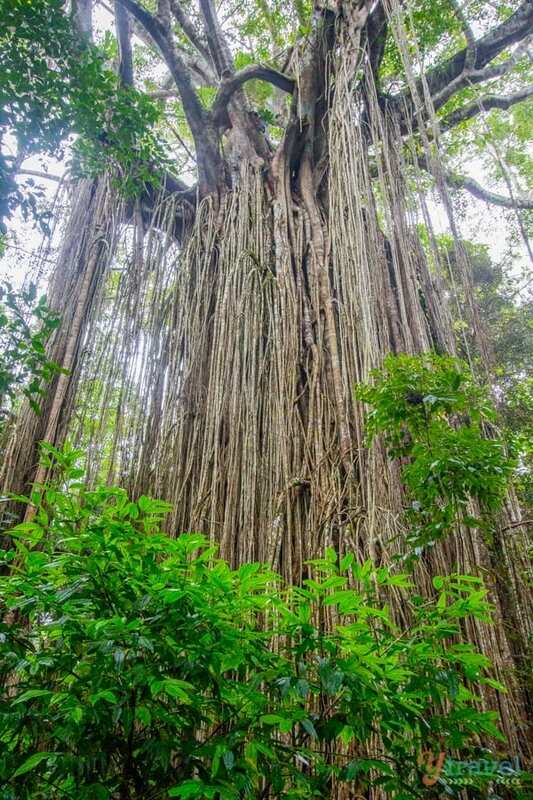 For a list of highlights check out our post Things to do in the Atherton Tablelands. Stop in at the Innot Hot Springs. Don’t expect to see any springs on a grand scale like Rotorua in New Zealand. It’s actually more of a small puddle, lol. But, it’s nice for sitting and really hot. 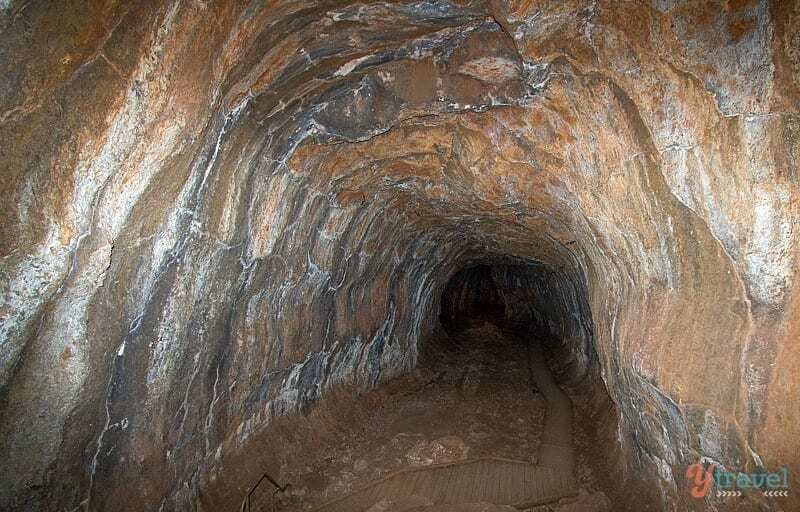 What a fascinating discovery Undara was! 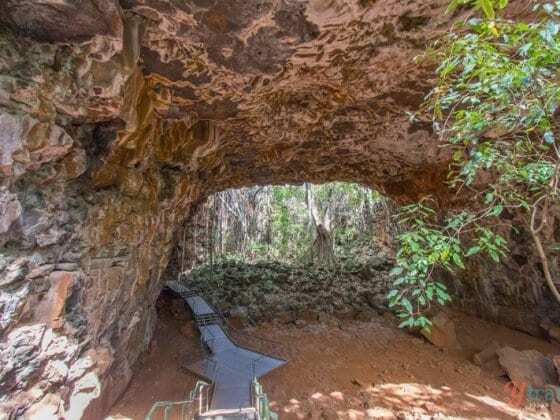 Here you will find the world’s longest lava tubes a phenomena I knew nothing about until coming here. Plan to spend two nights so you can make the most out of what’s on offer. 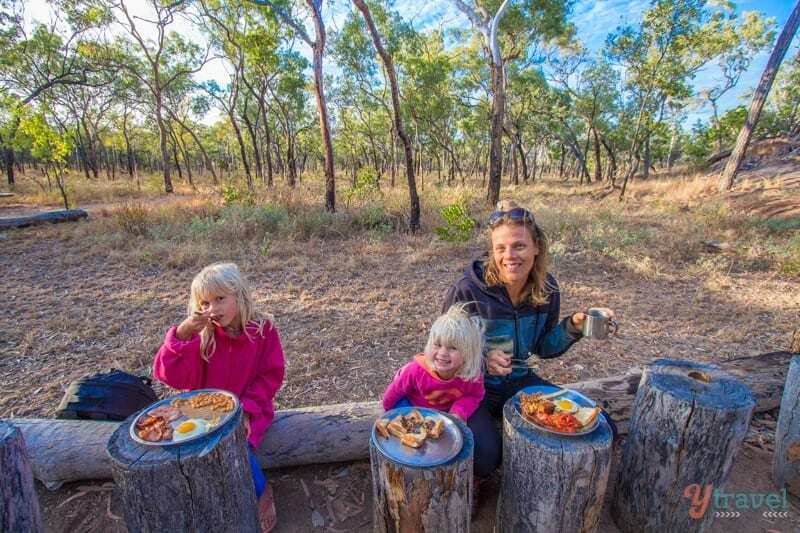 Do the Archway Explorer Tour and have a bush brekkie. You can set up your caravan or camper trailer, or how about sleeping in an old railway carriage. Stop at Mt Surprise along the way. Grab a burger – like they used to be before they were ruined – at the BP cafe. 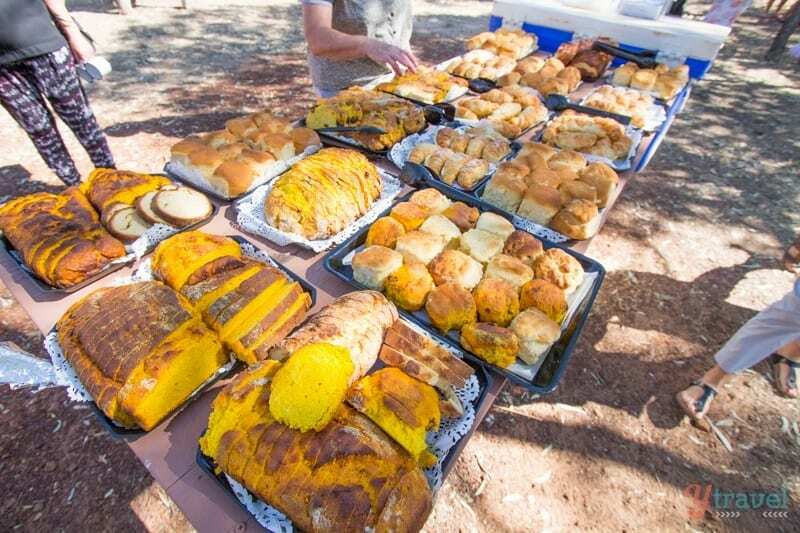 Fuel up at Georgetown before taking the unsealed 80km road to Cobbold. Pulling our Jayco Camper Trailer took us about 90 minutes for this section. The scenery is true outback gorgeousness with the red dirt, blue skies, huge termite mounds and scrub trees. I’d so love to see it in the wet when the greenery comes out. Yet another special place on the Savannah Gulf. 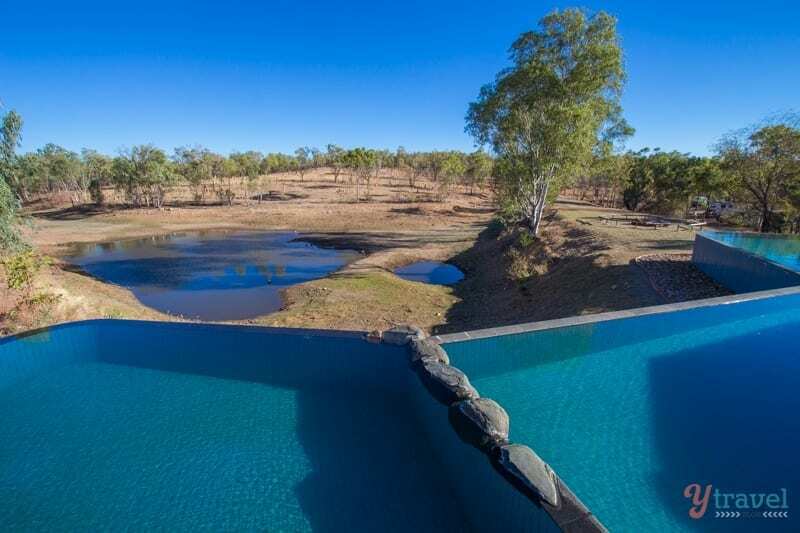 We stayed at Cobbold Gorge for one night, you might like to rest a while – it’s peaceful enough with plenty to keep you entertained, and the infinity pool has amazing views. 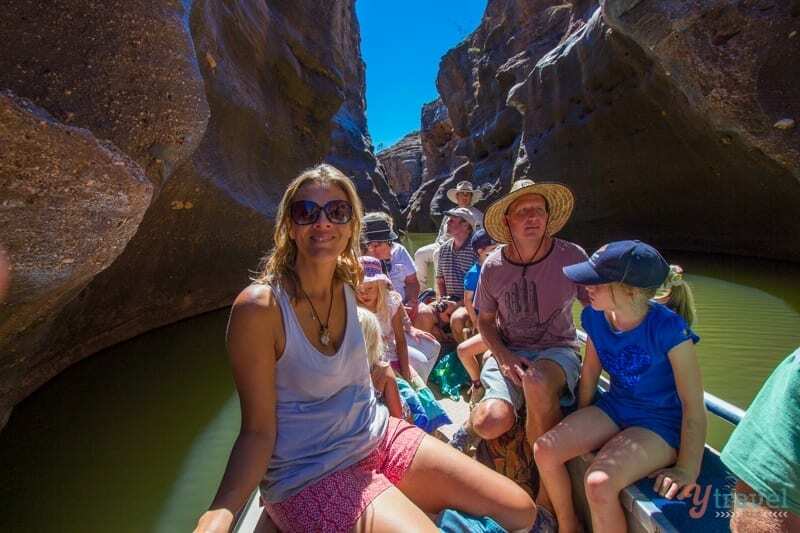 The only way to explore this narrow gorge is on a three-hour tour, which takes you on a boat trip through the gorge and a short walk up the escarpment. Our guide was extremely knowledgeable about the area and the Savannah Gulf and so passionate about it. It was easy to fall in love with it too. She shared many stories about the flora and fauna, took us to some beautiful view points and told stories about the early settlers and the mysterious death of pioneer John Corbett. There’s not much in between here and Normanton so be prepared for a drive of about 4 1/2 hours. We arrived in the afternoon and stayed for a night at the Albion Hotel so we could arrive early in the morning for our Gulflander experience. Don’t expect too much comfort here but the barra & chips for dinner in the pub restaurant was enjoyable. 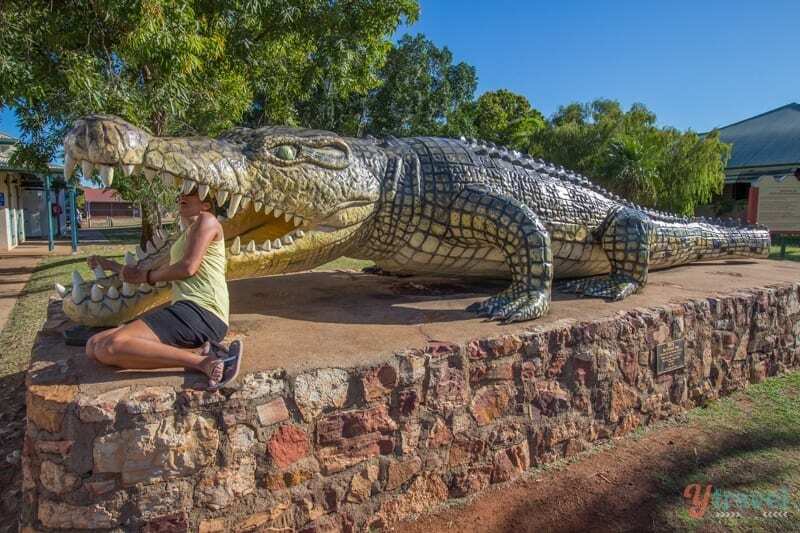 Normanton town is basically a refueling stop, although you can stick your head inside a replica of one of the largest crocs ever caught, Krys the croc, who measured a whopping 8.5 metres. Train enthusiasts will love this experience on the historic and legendary Gulflander. 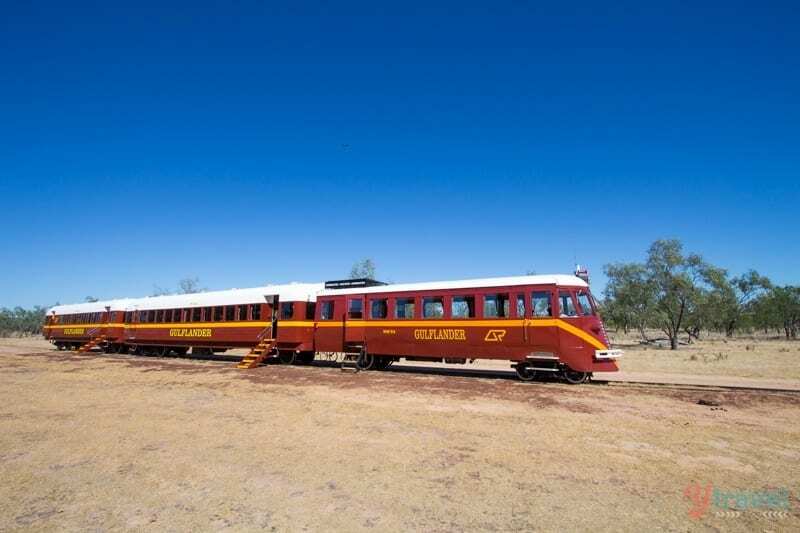 Originally built to connect the once bustling river port of Normanton with the rich gold fields of Croydon, today the Gulflander is a tourism icon and working tribute to the early pioneers of the Gulf of Carpentaria. 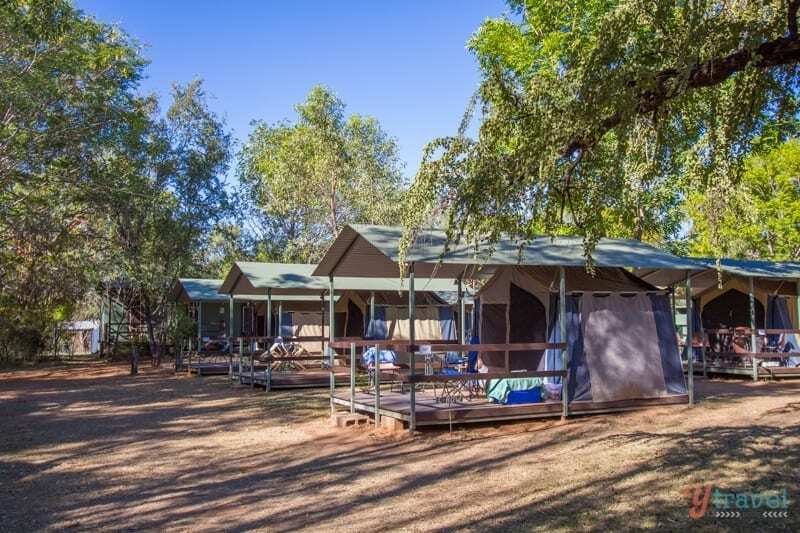 We experienced the “Billy tea and damper” excursion to Critters Camp located at the picturesque 11-mile camp. The three-hour journey is filled with anecdotes, facts, fascinating trivia and information about the history of the Gulflander, the Savannah Gulf landscape and it’s rich past. It was one of the best billy and damper teas I’ve experienced on this road trip so far. 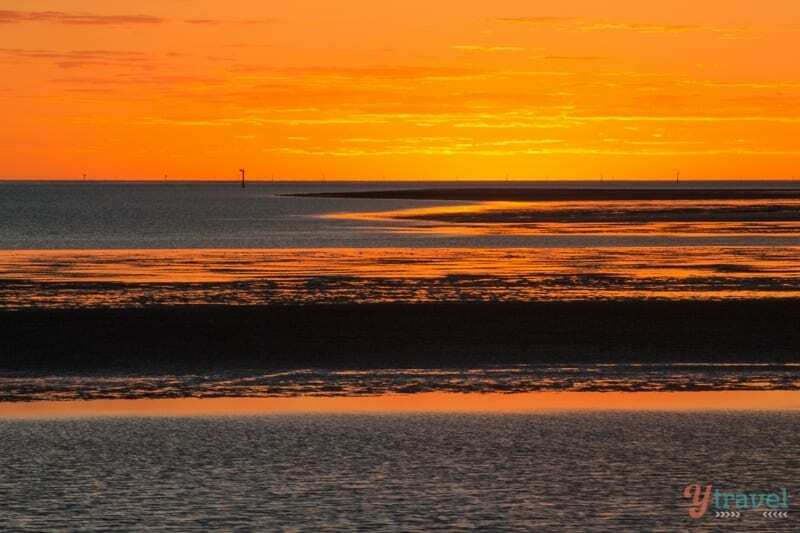 If you love fishing or stunning sunsets then Karumba, only an hour’s drive from Normanton, is worth a visit. 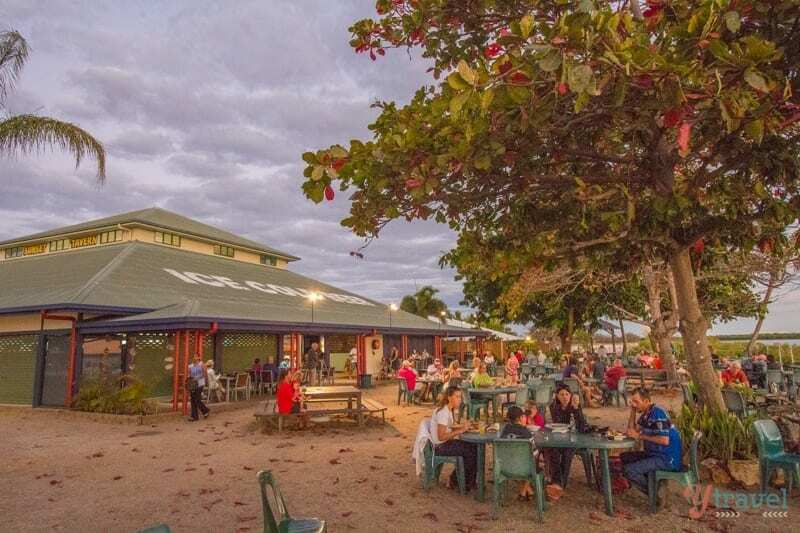 It’s a very chilled beach town, but remember no swimming in the beach here – this is croc territory! Grab a drink, and some takeaway fish and chips from Ash’s across the road and sit on the beach and watch the sky light up in flames as it goes down. There’s also a sunset tavern should you wish for tables and chairs and a more formal dinner. We stayed in a unit at Ash’s on the Point for two nights. Sunset Caravan Park is just down the road. Fishing is the thing to do here and many people get stuck here for months spending their mornings bringing in the catch for the day – or perhaps for the week. Like our friend Emma who returned with six blue salmon and a beaming smile. There are two ways you can go here. The unsealed road via Burketown, or the sealed road via the Burke and Wills Roadhouse. 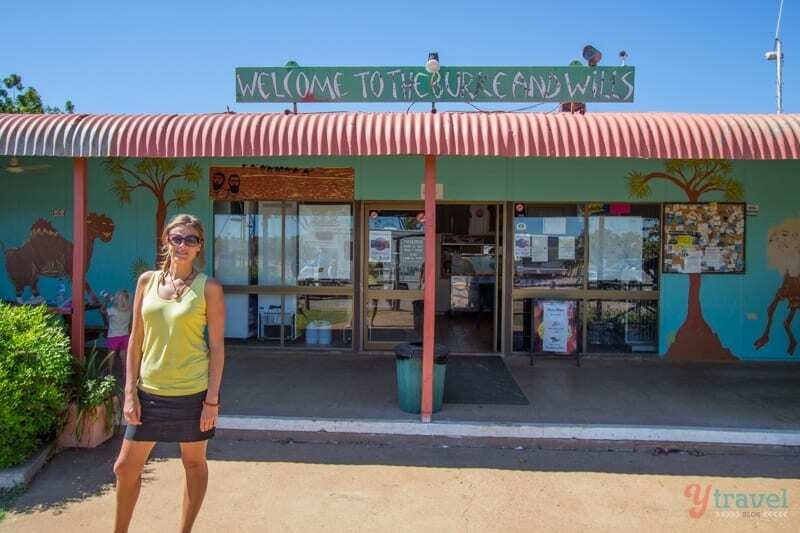 We found the Burke and Wills disappointing and just a fuel stop and a place to stretch the legs and grab a quick bite to eat. 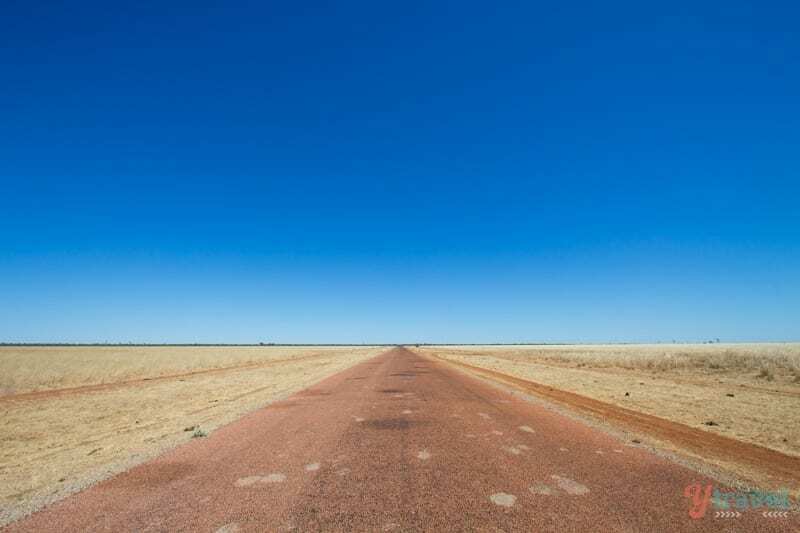 The drive on the sealed road takes about four and a half hours and takes you through pretty outback scenery. 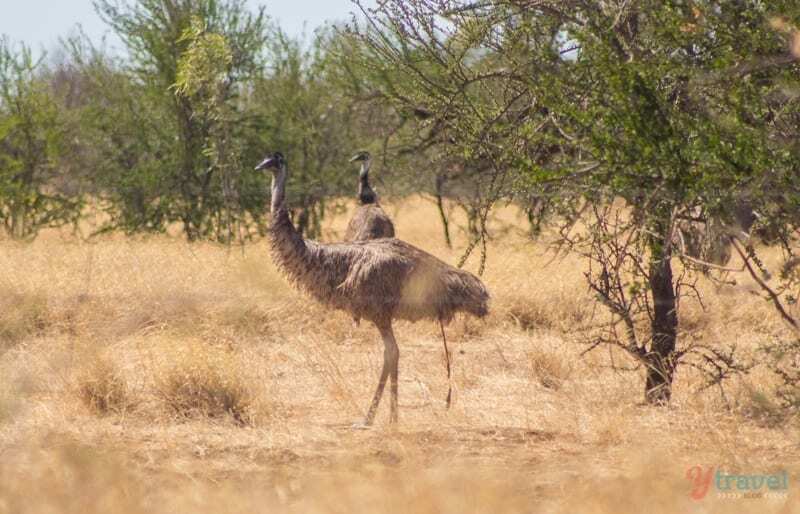 This was the first time we’d seen emus in the wild and the Big Red kangaroos. This is one of those moments where the difference between wet and dry water levels will blow your mind. 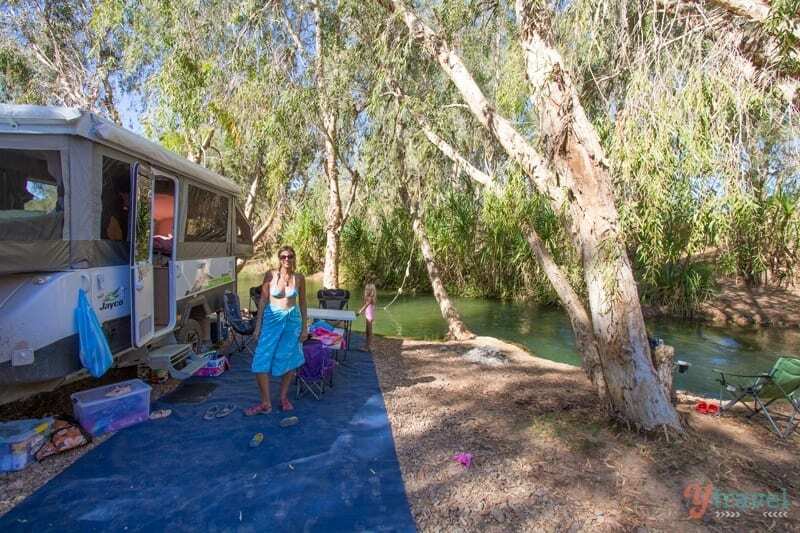 You can free camp on the dry river banks of the Gregory River. Look up several metres into the paperback trees and see the debris of branches stuck above so you know how high this river gets. The little fast flowing stream next to your campsite leaves no clues. Except those related to fun. Grab your tube, or boogie boards and jump in and allow the stream to take you for a ride. Watch the sharp turning corners – odds are you’ll end up in the pandanus bushes on the other side. Kick yourself off though, don’t grab them as you could slice up your hands. 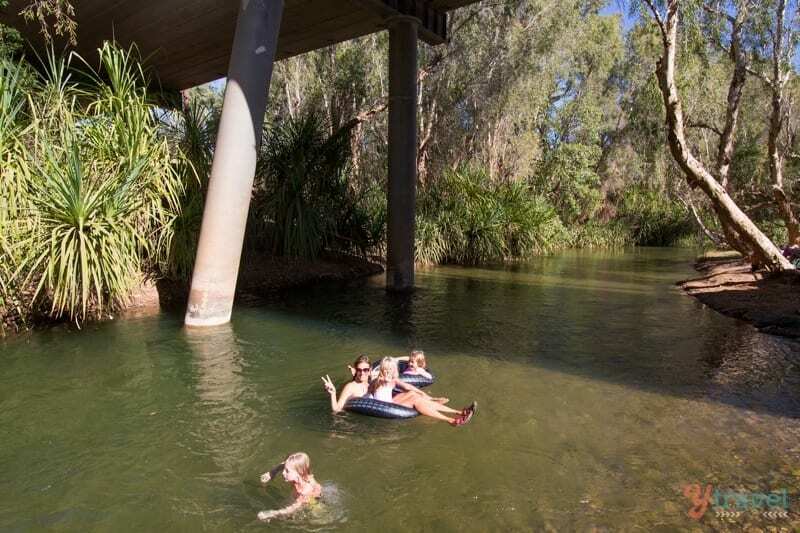 This outback oasis is a little piece of serenity and a definite place to kick back for a day or two and converse with the trees. There’s a small pub a short walk back up the hill that does meals, cold beer and fuel. Next up was a relatively short drive of 90km from Gregory River to Adels Grove, which feels like it’s just around the corner for Outback standards. Lots of open road and blue sky to take in here. For those wanting a little more civilization and facilities, you can either camp at Adels Grove or stay in furnished river tents or rooms. 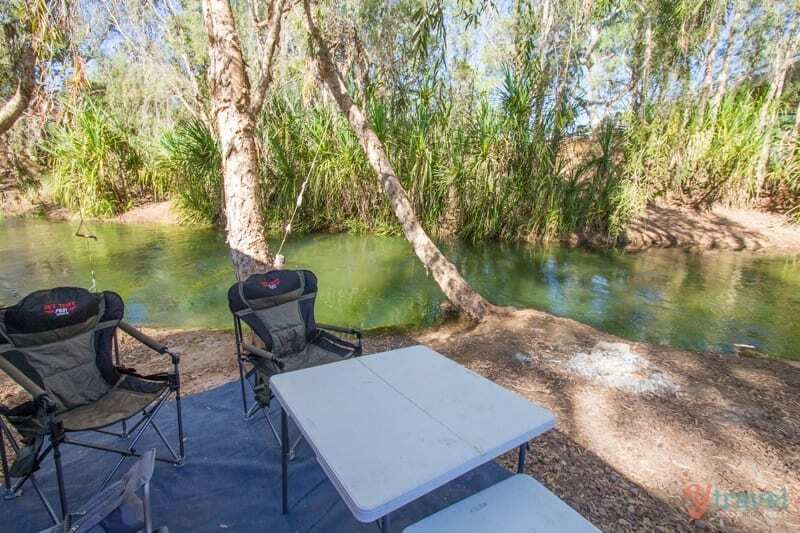 There is a beautiful creek and natural swimming hole beside the shady camp sites, or a more secluded camping spot out the back. A two-course meal and buffet breakfast is on offer at the restaurant. From Adels, you have easy access to the amazing Boodjamulla National Park via a 10km unsealed road. 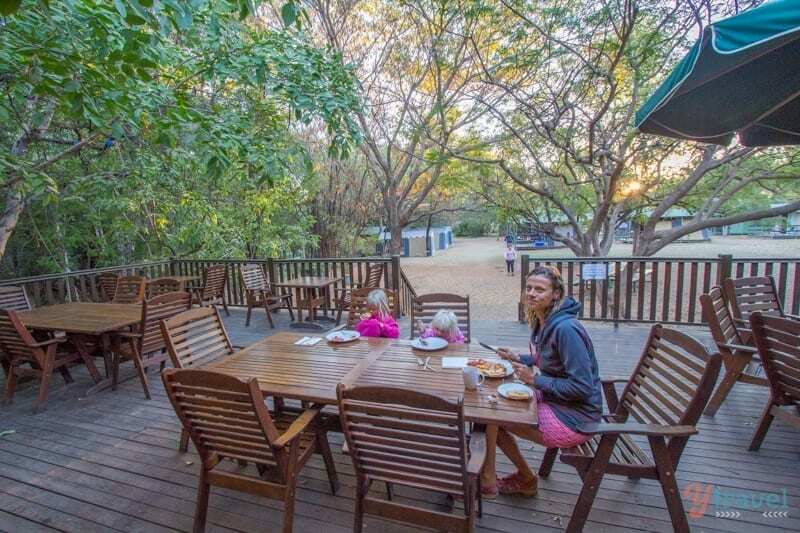 Camping at Adels starts at $34 and Dinner, bed and breakfast packages start at $270. Boodjamulla National Park has been one of the most delightful finds on our Australian road trip so far. 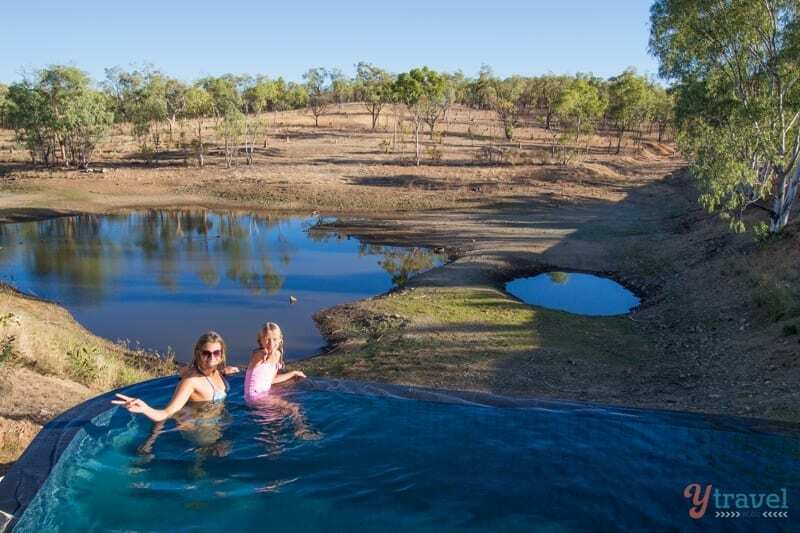 How had we never heard of this magical oasis in the middle of the Queensland Outback? Walt Disney could not have designed it any better. Emerald colour water so clear you can see the fallen logs and big fish swimming by. If you’re lucky you might even spot a freshwater croc. No salties here, which means swimming is okay. 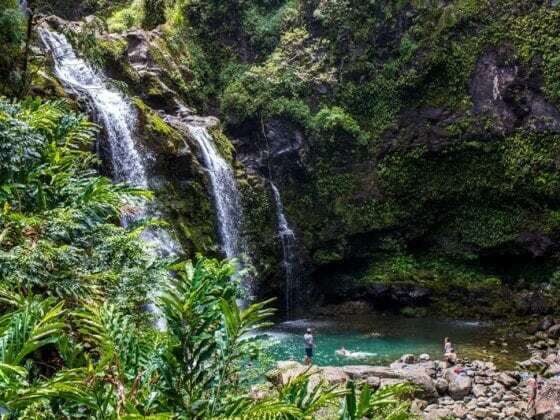 And what incredible kayaking and swimming there is on offer – gushing waterfalls and overhanging ferns and palm trees. 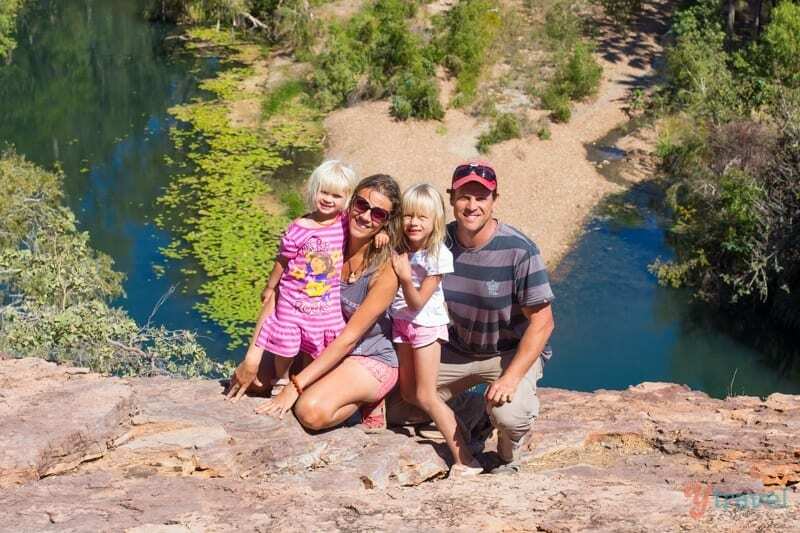 It offers so much more with beautiful bush and gorge walks to take it all in. 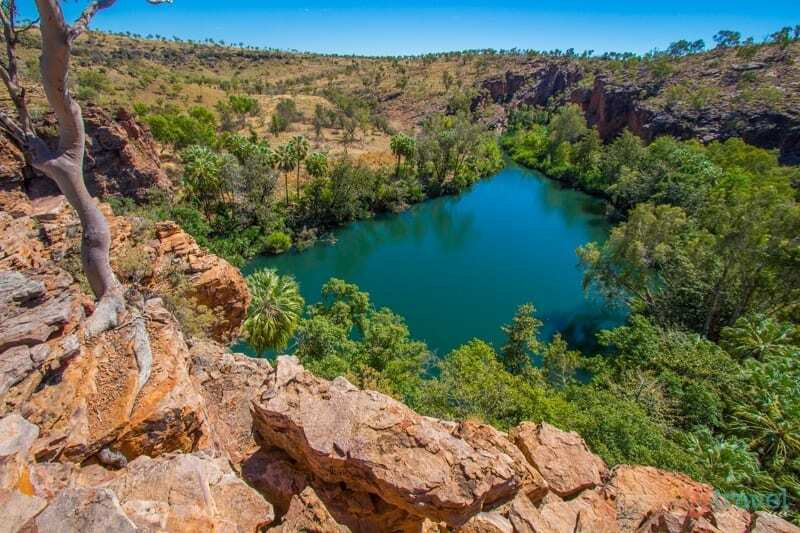 Don’t miss the Upper Gorge lookout walk. From Boodjamulla, we took the drive to the Northern Territory border with a stop off at Camooweal pub for some lunch. 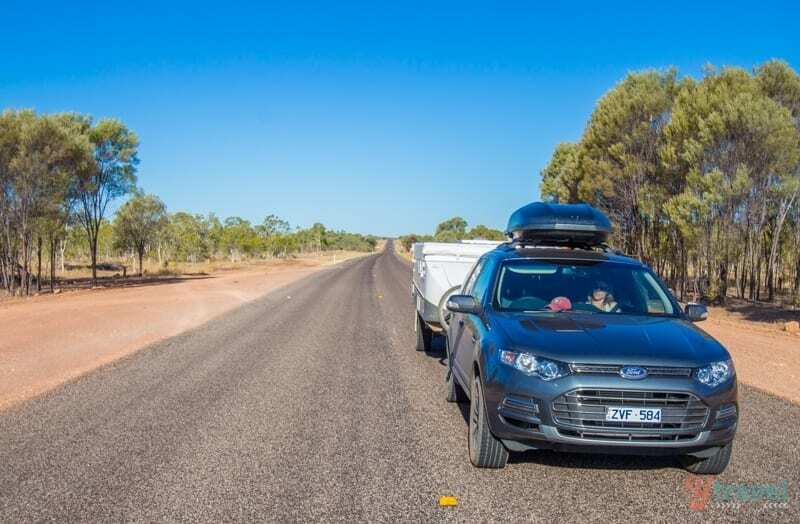 All up from Cairns to Boodjamulla we drove 1,786km along The Savannah Way and enjoyed every minute of it, well almost, I don’t think you’ll find us back in Normanton anytime soon, but it’s definitely one of our road trip highlights of our trip around Australia so far. 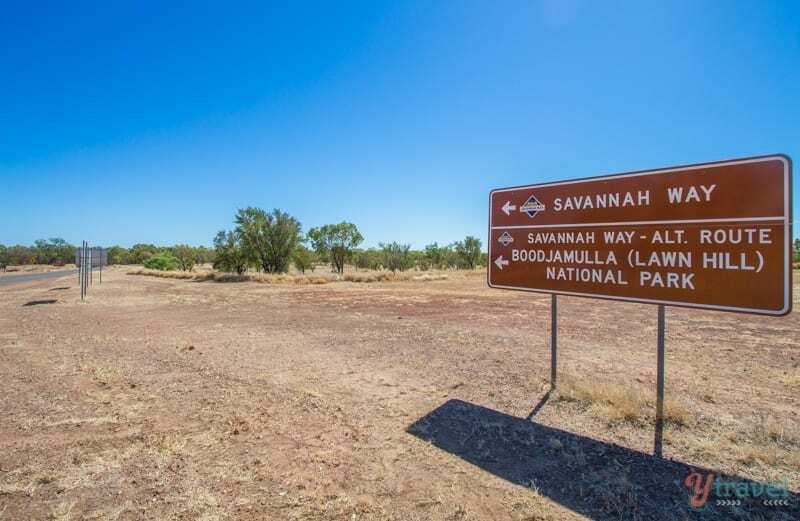 For more information on driving The Savannah Way and other drives in Outback Queensland visit DriveNorthQueensland.com.au. Have you driven The Savannah Way? Please share any thoughts in the comments below! I am very pleased that you visited the Cobbold Gorge and all it’s hidden secrets….the thing about the western plains/tableland and beyond is the people, country pubs, dry creek beds that do come to glory in the wet indeed, some places I have not yet visited although it is my “home” state, so to speak! We did a figure-8, down to Tas, up the middle and down the West coast, saving outback qld for last (since we live here? 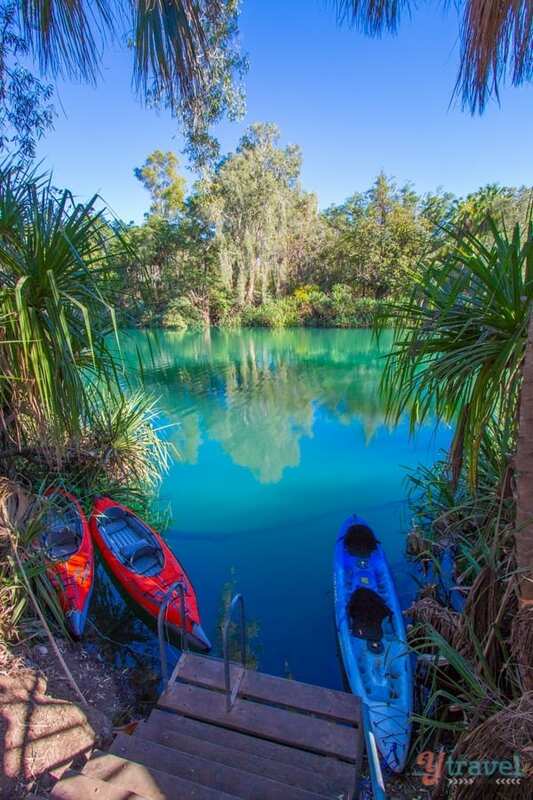 )….sold the van (Windsor Rapid, highly recommended), bought an awesome boat yet sometimes seek the adventures of the land less travelled and all those places we missed or wished to further explore! 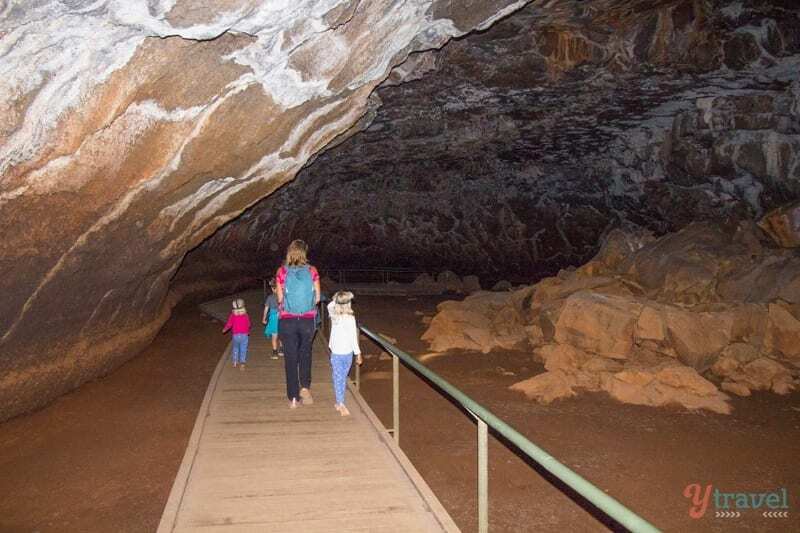 I like your blogs very much and re-live our own adventures from 11 years ago…our girls/adventurers are nor 16 & 14 and it has influenced them somewhat, despite the fact they only turned 5 and 3 during the big trek down-under…saving “home-schooling” time, so we thought!! Yes definitely consider it. I think 10 to 14 days is a good period of time so you’re not too rushed. 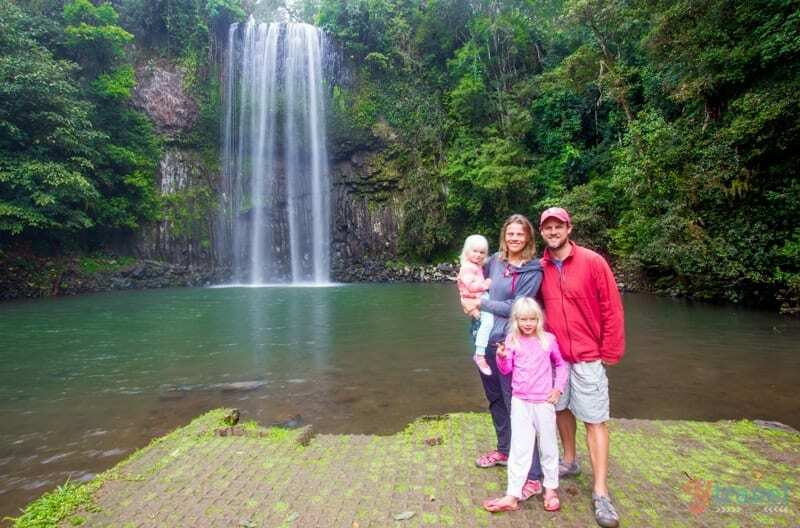 We stayed for 2 nights each at Atherton Tablelands, Undarra, Karumba, and Boodjamulla with one night at Cobbold Gorge. We took about 2 weeks. 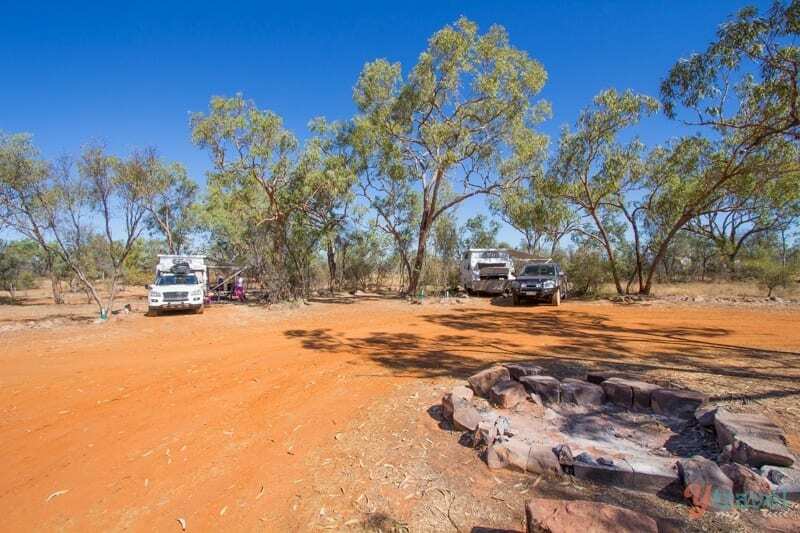 2 nights Undara, 1 night Cobbold Gorge, 1 night Normanton, 3 nights Karumba, 1 night Gregory River, 1 night Adels Grove, 3 nights Boodjamulla. It just depends on how much time you have and what you’re interested in. 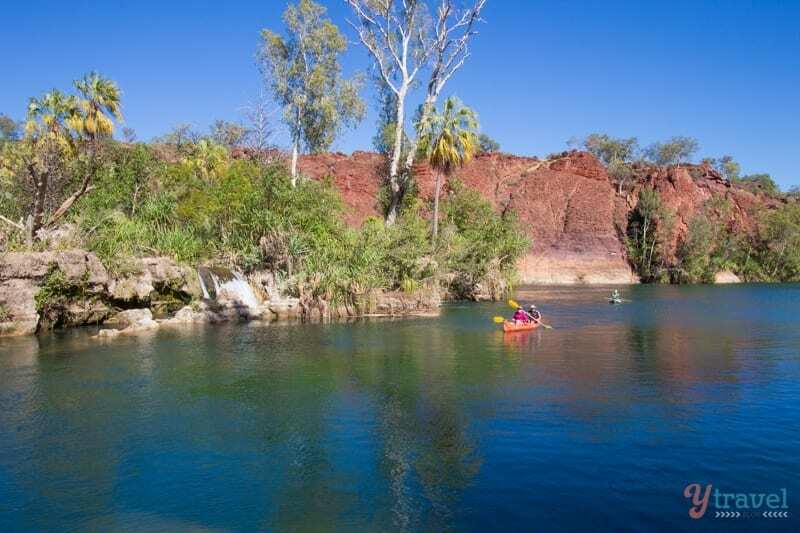 Definitely don’t miss Boodjamulla and Gregory River! This looks like an amazing trip. I didn’t know there was so much out that way you’ve made me want to go there now. Neither did we Bonny. Was a great eye opener! STay tuned – one is coming. Probably next month. Great post, guys! That’s a fantastic resource for people doing that route. I’ve done it a couple of times with my parents as a child, and did half of route (twice again) with my hubby updating guidebooks. We really took our time, taking months to do it with my family, and weeks with Terry. As you discovered, there’s so much to see and do the way. I actually remember the 1974 floods, although we experienced on coastal Queensland. I was only seven years old but I distinctly remember the water entering the car and I had to put my legs up on the seat. It was a short trip so we were driving Mum’s purple Mustang (no 4WD and caravan that trip) which was never the same again. But it was quite an adventure! I did part of the Savannah Way in 2012 (Normanton to Cairns) in a Commodore. I did part in 2015 (May) including Undara and Cubbold by motorcycle. 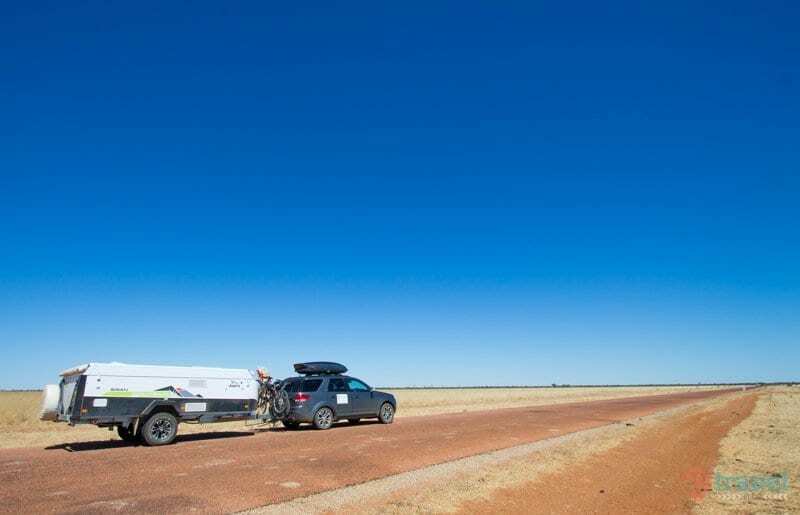 This was a section of a fund-raising ride for the RFDS (Cairns to Perth along the Outback Way) – cut short by an accident halfway between Yulara and the WA border. 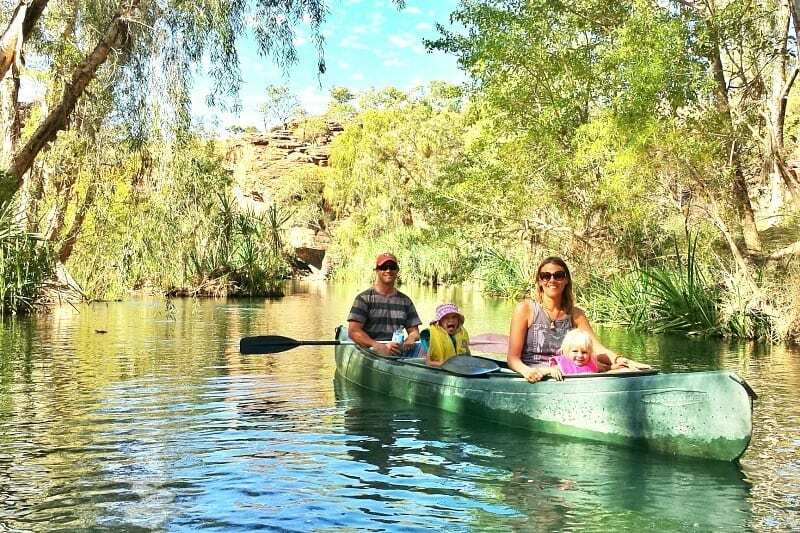 There are so many beautiful areas in the outback – but few actually visit them, preferring instead to travel overseas. I want to visit as many as I can – but people like you keep on finding more and making planning more difficult! lovely website you have. 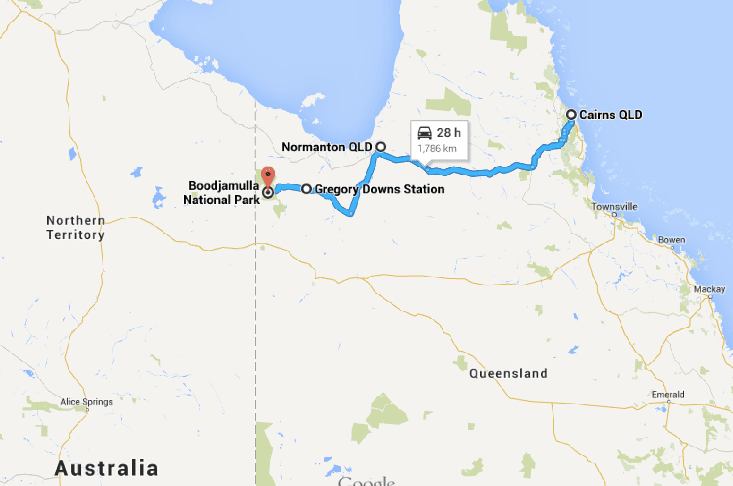 We’re planning to take a trip through Queensland this winter in july and August. The savannah road trip looks amazing. We just wonder how you returned. Did you just drive the whole 1700+ kilometers in one stretch? or is there a more interesting way to return to the coast?